Azure is one of the leading cloud service providers. 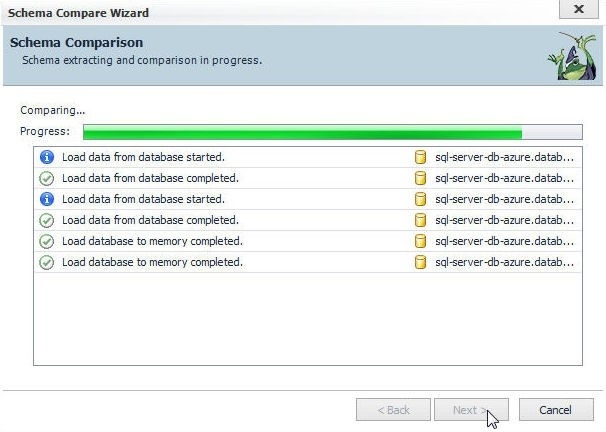 Azure SQL Database is a fully managed relational cloud database service for developers. In an earlier article we discussed creating an Azure SQL Database instance and connecting to the SQL Server with Toad for SQL Server. 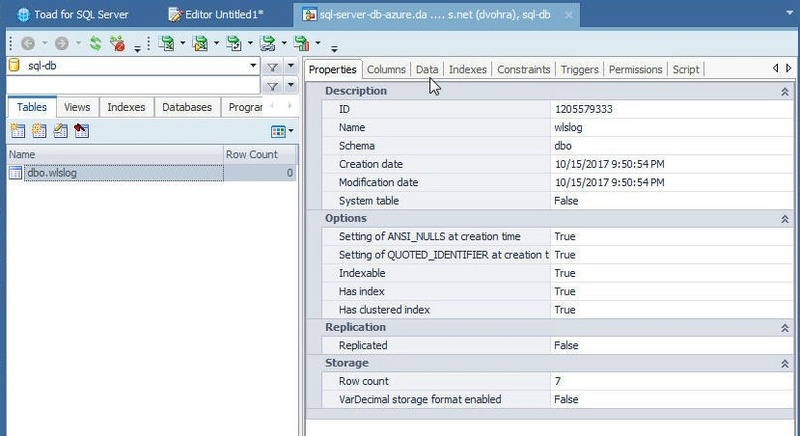 In this continuation article we shall discuss some of the Toad for SQL Server features with the Azure SQL Database service. This article has the following sections. We shall create a table wlslog with columns logid, category, type, servername, code, and msg. The primary key column is logid of type int and all the other columns are of type VARCHAR. 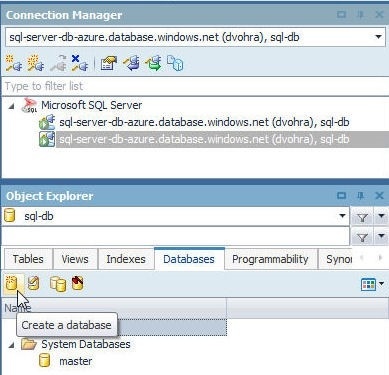 To create a table click on Create a table in Object Explorer with the Tables tab selected and the sql-db database selected as shown in Figure 1. 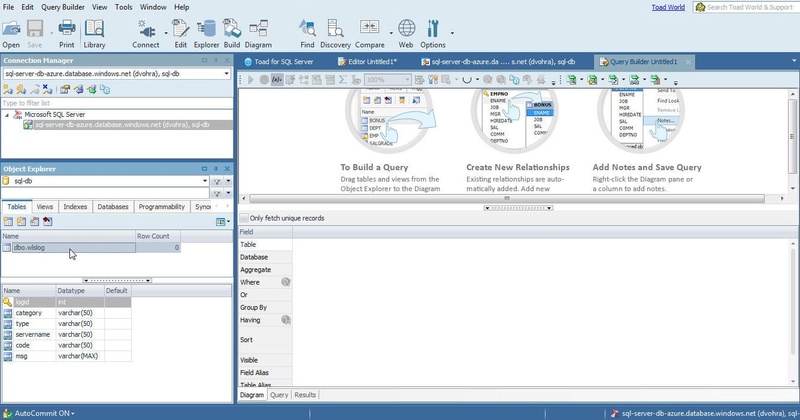 The Create Table wizard gets launched as shown in Figure 2. The Database is preset to sql-db and the Schema is preset to dbo. A different Schema may be selected from the drop-down. Specify a table name in Name (wlslog) field. A default first column is provided with Column Name and Type set to dummy (place-holder) values. Modify Column Name to logid and keep data type in Type drop-down asint, which is the default data type. 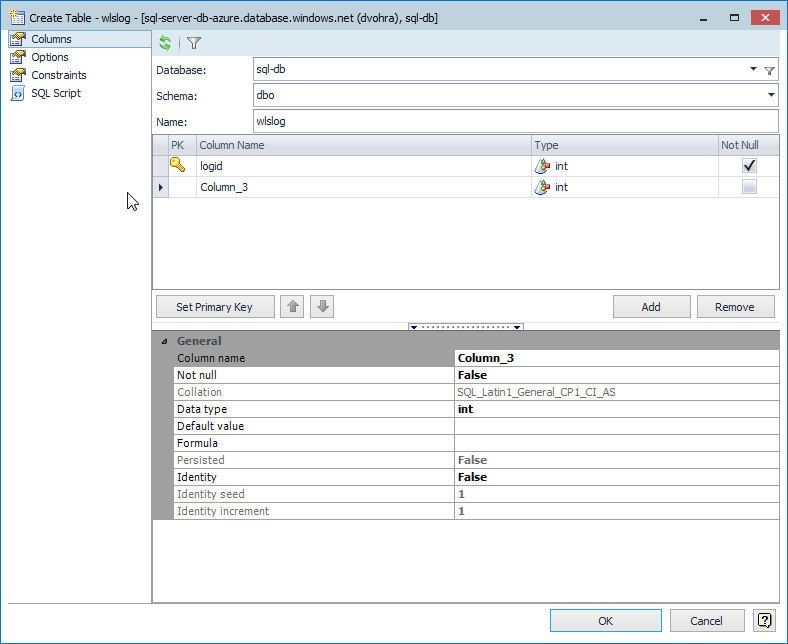 Select the Not Null checkbox and click on Set Primary Key set the column as primary key as shown in Figure 3. Click on Add to add another column as shown in Figure 4. Another dummy column gets added, as shown in Figure 5. Set column name to category and select data type as varchar(50) as shown in Figure 6. Click on Add as shown in Figure 7 to add the third column. Similarly, add each of the other columns as shown in Figure 8. Click on OK when all columns have been added. A confirmation dialog indicates that table has been created, as shown in Figure 9. Click on OK. 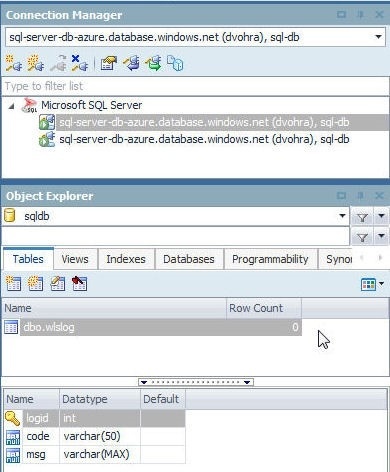 The wlslog table gets added to Object Explorer>Tables, as shown in Figure 10. The columns get displayed. In this section we shall add table data using the following DML SQL script. 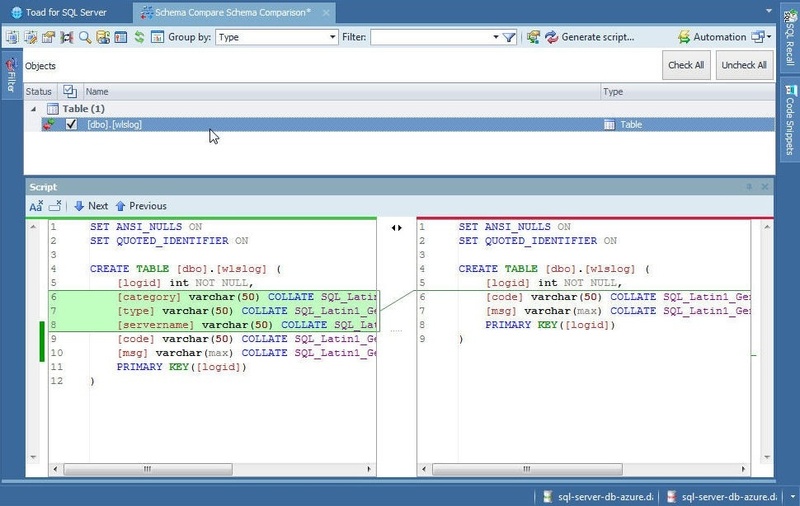 To run the SQL we need to launch the SQL Editor by selecting Edit from the toolbar as shown in Figure 11. 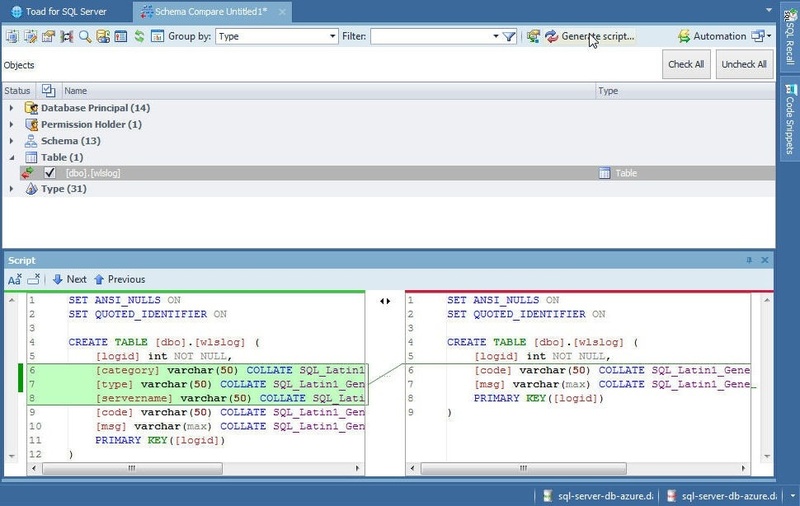 A SQL Editor gets launched, as shown in Figure 12. 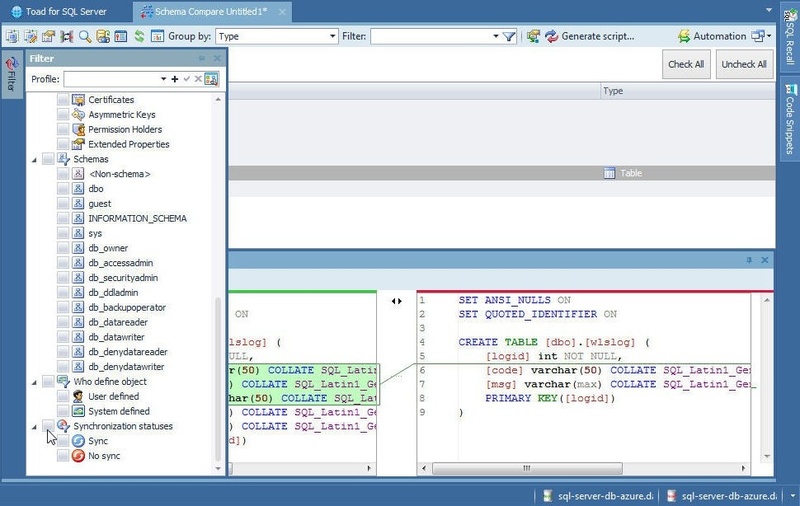 Copy the SQL script to the SQL Editor and click on Execute scripts as shown in Figure 13. 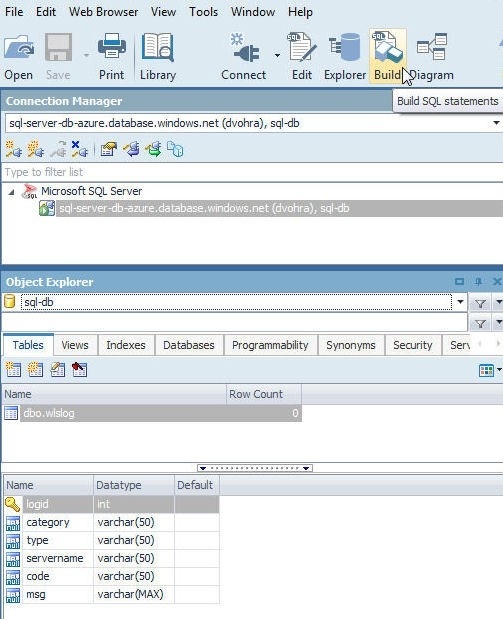 The SQL runs to add data. As a message in Messages tab indicates, 7 rows are affected, as shown in Figure 14. Next, we shall query the table created; for which, we shall need to launch the Query Builder. Click on Build in the toolbar as shown in Figure 15. The Query Builder gets started. Select the wlslog table in the Object Explorer as shown in Figure 16. 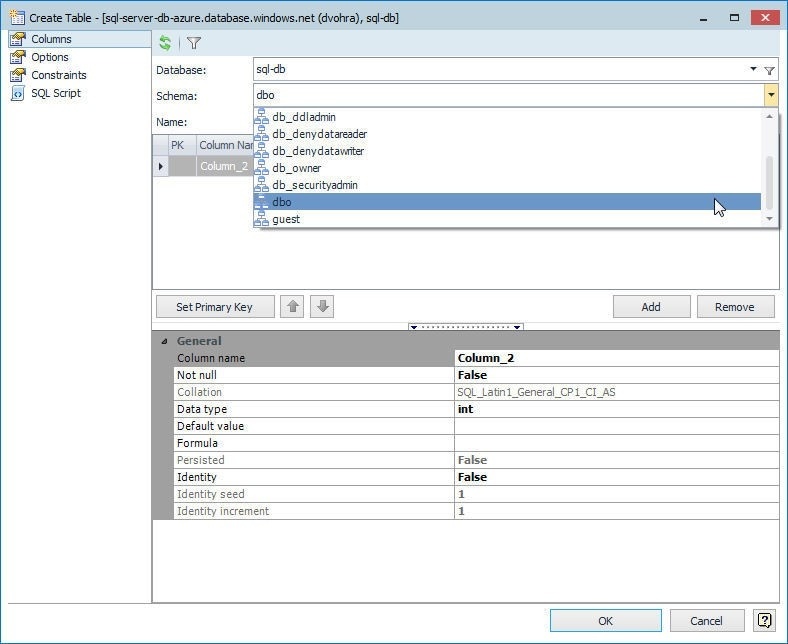 Drag and drop the table to the Query Builder Diagram pane as shown in Figure 17. A diagram gets created from the table with selectable columns listed, as shown in Figure 18. Columns to include in a query may be selected individually by selecting checkboxes corresponding to the columns, or collectively by selecting the Add All Columns checkbox, as shown in Figure 19. 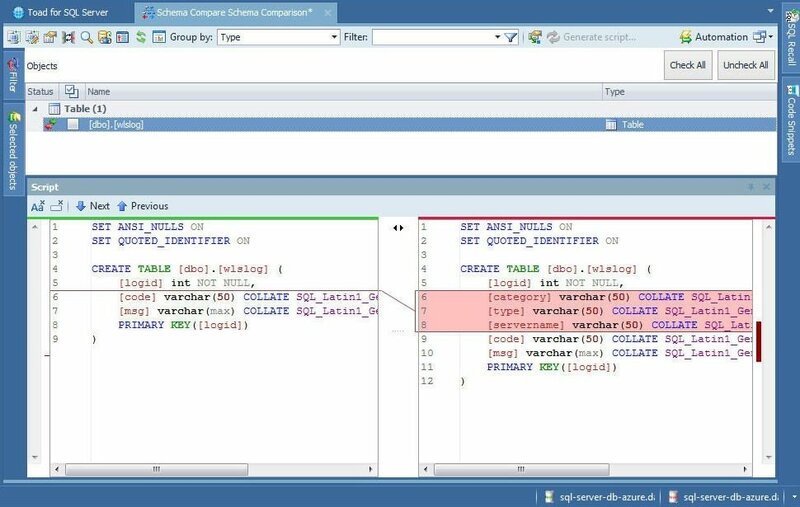 The Query tab displays the SQL query statement generate from the diagram, as shown in Figure 20. 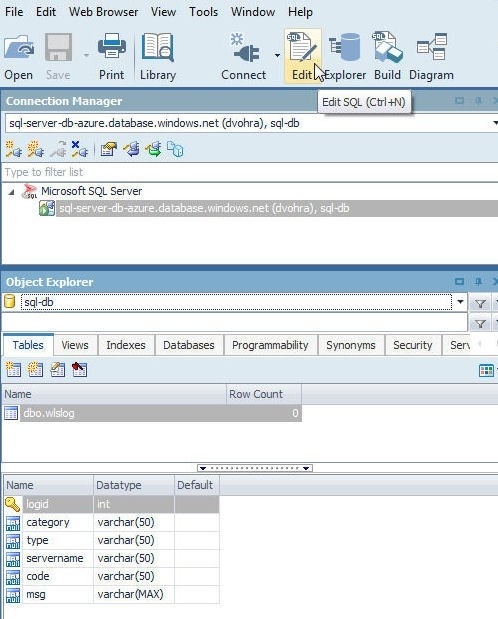 Click on Execute the SQL Statement as shown in Figure 21 to run the query. The result set generated is displayed in Figure 22. 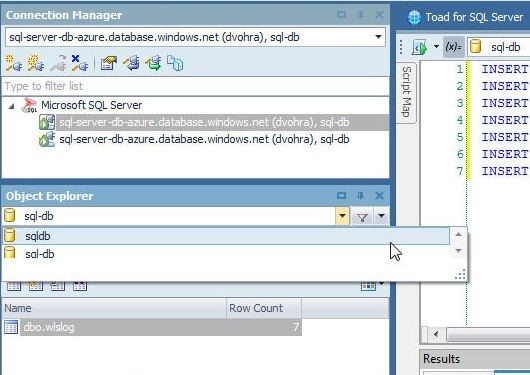 To explore database objects, Toad for SQL Server provides the database Explorer. Click on Explorer in the toolbar as shown in Figure 23. The Explorer gets launched, as shown in Figure 24. 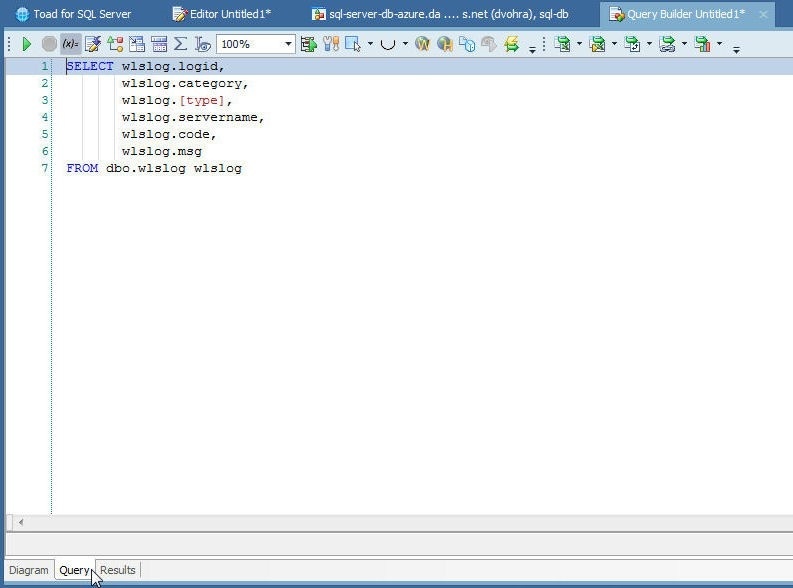 Select the dbo.wlslog table and its properties get displayed in the Properties tab. Click on the Data tab to display table data as shown in Figure 25. If the Connection Navigator has only one connection the connection is the current connection but if multiple connections are created only one connection may be selected as the current connection. To demonstrate, first we shall create multiple connections. Right-click on the one connection in Connection Navigator and select Create Like… as shown in Figure 26. The Create New Connection gets displayed, similar to when creating a new connection, but with the difference that all the field values except the Password are pre-specified, as shown in Figure 27. Specify the Password and click on Connect as shown in Figure 28. A new connection gets created and gets added to the Connection Navigator, as shown in Figure 29. The new connection is indistinguishable from the connection copied from. But only one connection gets set as the current connection, as indicated by the icon with a dotted square. The connection that is not the current connection does not have the dotted square. To make the connection that is not current as the current connection right-click on the connection and select Set As Current… as shown in Figure 30. The connection gets set as the current connection as shown in Figure 31. 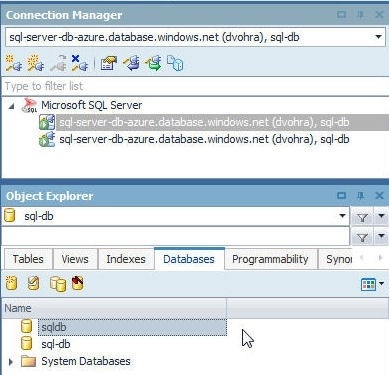 When we created the Azure SQL Database service we created only one database instance, sql-db, which is listed in the Object Explorer. Additional database instances may be added to Azure SQL Database Service from Toad for SQL Server. To create a new database select the Databases tab and click on Create a database as shown in Figure 32. 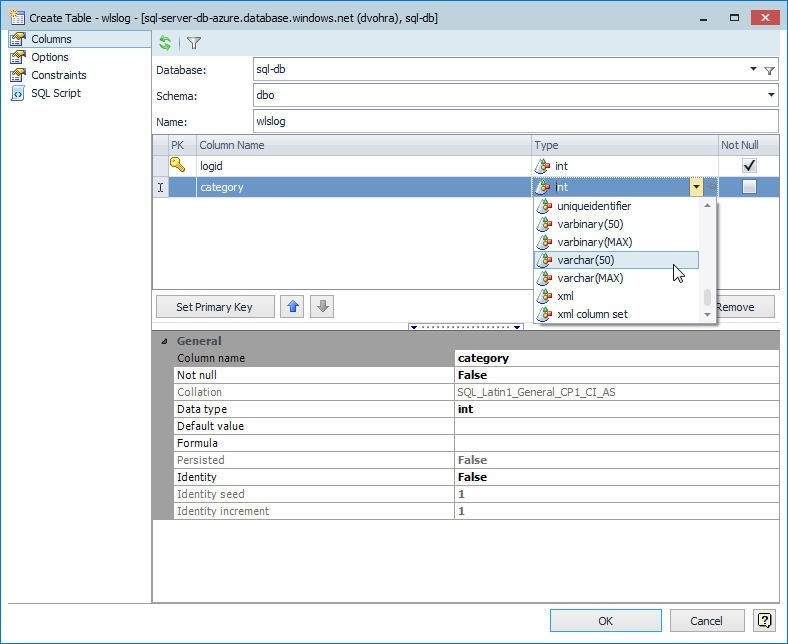 The Create Database wizard gets started, as shown in Figure 33. 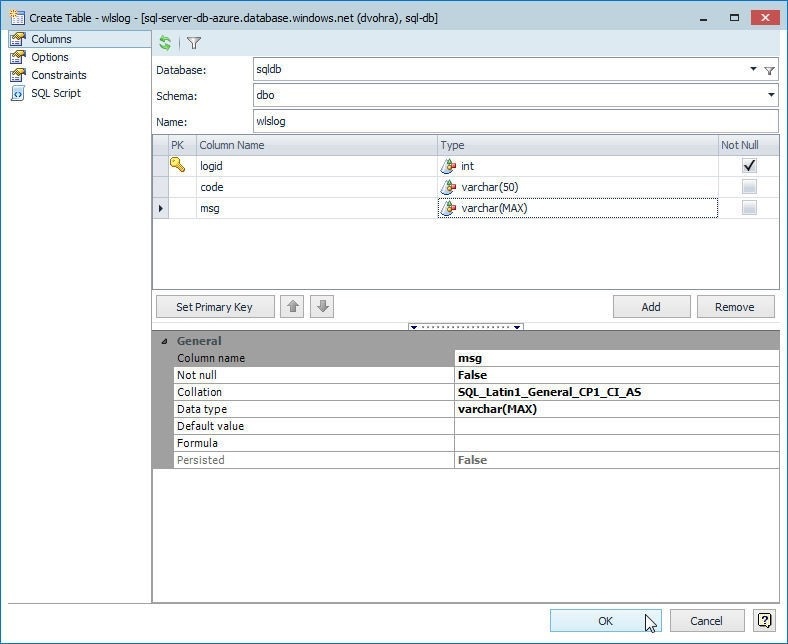 Specify a database name (sqldb) in the Name field and click on OK as shown in Figure 34. 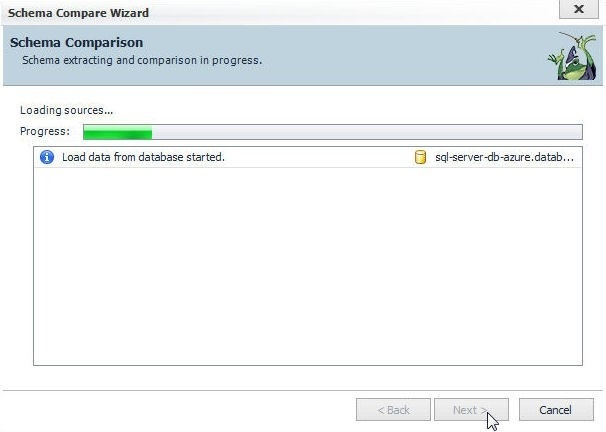 A confirmation dialog indicates that a new database has been created, as shown in Figure 35. 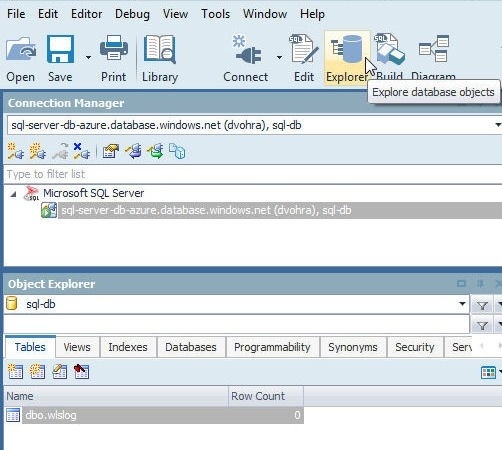 The new database sqldb gets listed in Databases, as shown in Figure 36. The new database sqldb also gets listed in Azure SQL Database service, as shown in Figure 37. 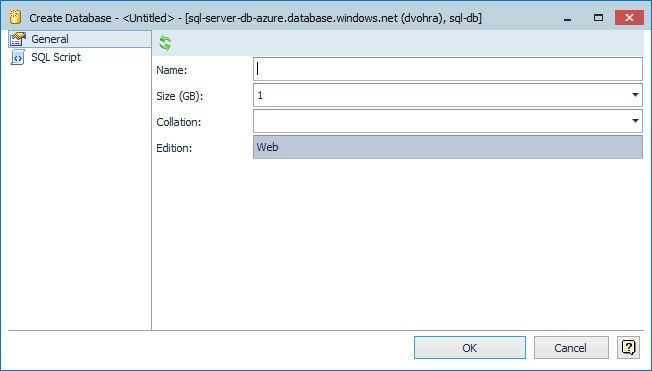 Toad for SQL Server may be used as a tool to create a new database instance in Azure SQL Database service, as demonstrated. 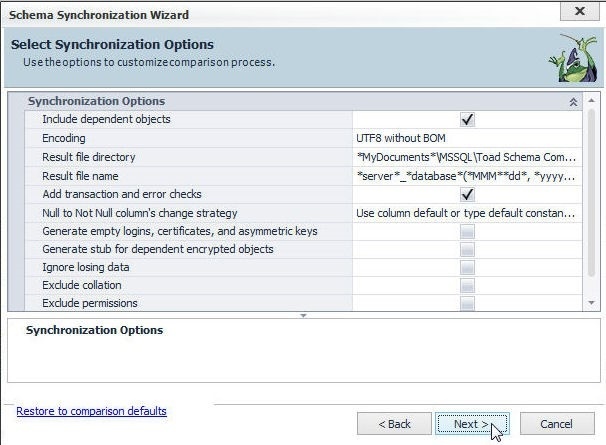 Toad for SQL Server may be used to compare different schemas, too. 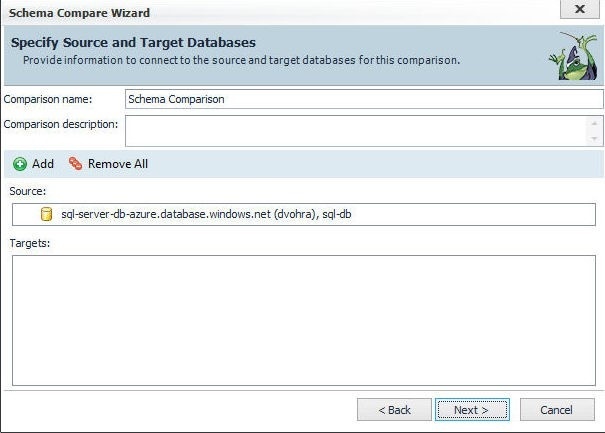 To perform a schema comparison we would need to provide a source database and a target database. To demonstrate schema comparison it would be suitable to create tables that are different so that the comparison includes some comparable result. 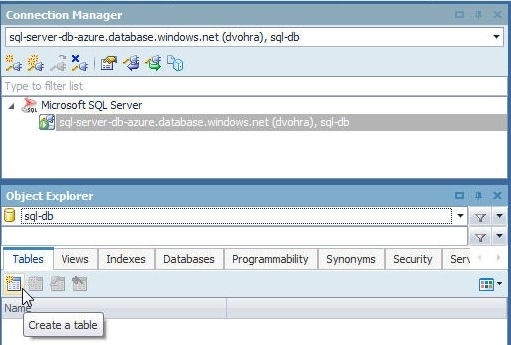 We shall use the sql-db with its wlslog table as one of the databases for schema comparison. 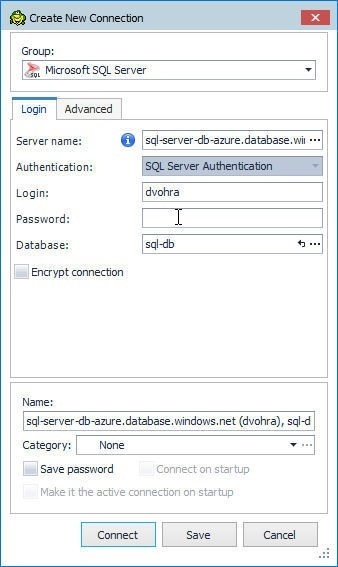 For the second database we shall use the sqldb database that we created. Add a table also called wlslog to the sqldb database but make the table columns different. 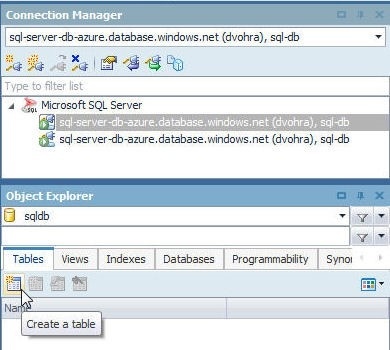 To create a new table in the sqldb database, first select the database, as shown in Figure 38. To create a new table click on Create a table as before and as shown in Figure 39. The database must have been selected as sqldb. Create a new table, which is also called wlslog, with the procedure discussed in detail when creating the first wlslog table. The wlslog table in the sqldb database has only three columns: logid, code, and msg, as shown in Figure 40. The table created is shown in Figure 41. To launch the Schema Compare Wizard select Compare in the toolbar or right-click on a table in Object Explorer and select Schema Compare>Compare and sync schema objects as shown in Figure 42. 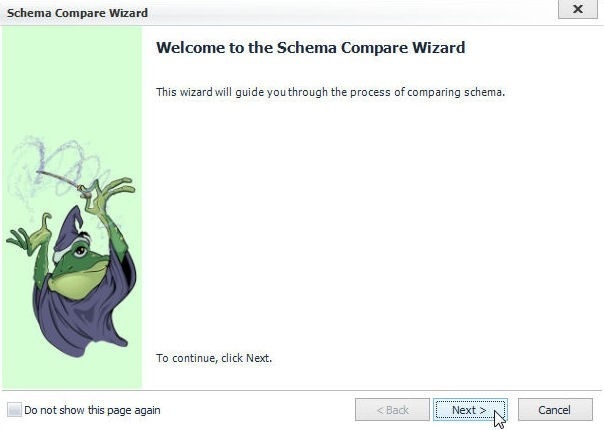 The Schema Compare Wizard gets launched, as shown in Figure 43. Click on Next. Next, the Specify Source and Target Databases screen gets displayed, as shown in Figure 44. Default Source and Target databases may have been selected. Click on Add to add a source and a target. The Select source and target (s) window gets displayed, as shown in Figure 45. The first selected connection is set as source. A selected connection gets added to the Selected Items column with the x option added to remove the connection from the Selected Items. 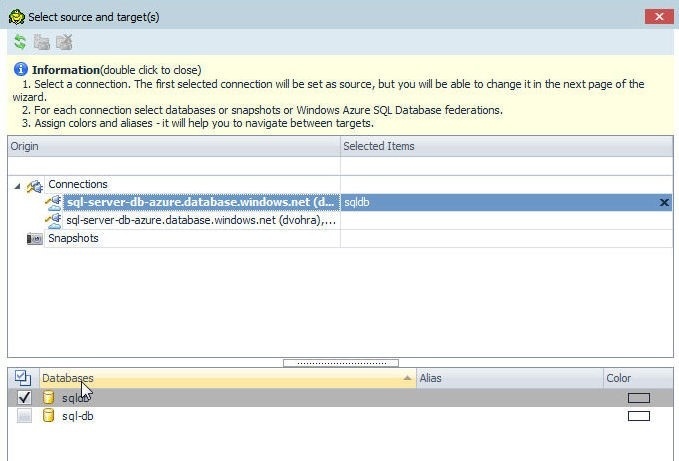 For each connection select databases or snapshots or Azure SQL Database federations. 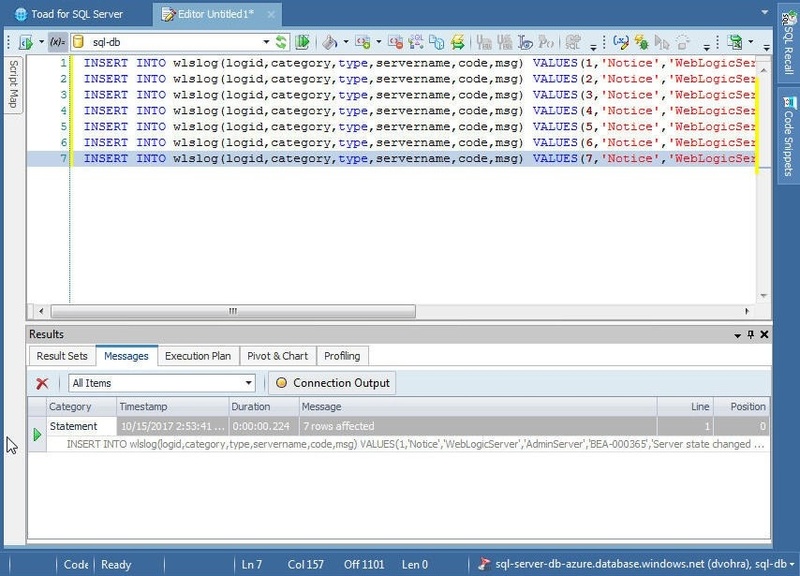 The sqldb database is shown to be selected as the first database in the first selected connection. 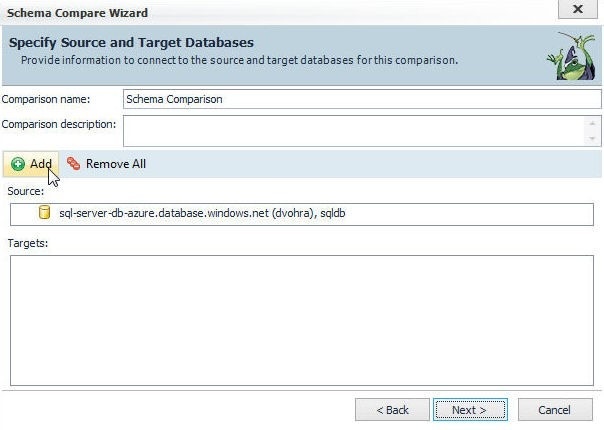 The connection and database for each of source and target(s) for schema comparison may be modified. 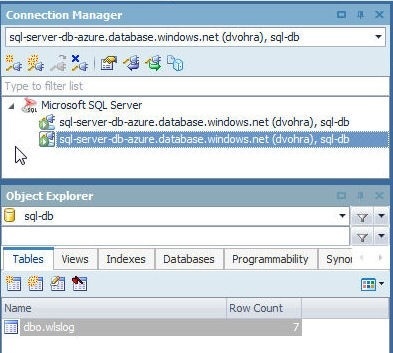 As an example, in the selected connection select the sql-db database as shown in Figure 46. Click on OK. 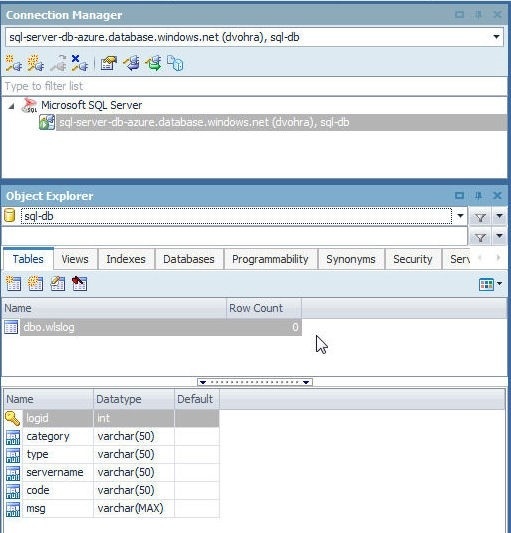 The sql-db database gets selected as the Source, as shown in Figure 47. Earlier the Source was set to sqldb. After both source and target connections have been selected click on OK as shown in Figure 48. 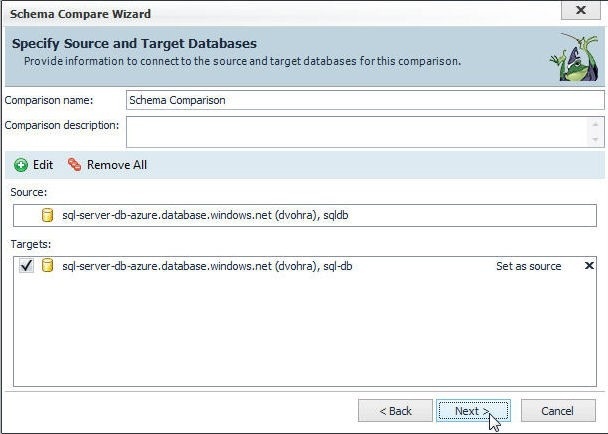 Both the Source and Target Databases are listed in the Schema Compare wizard in Figure 49. Click on Next. Next select the objects to compare. To select an object click on Add. To remove all objects click on Remove All. 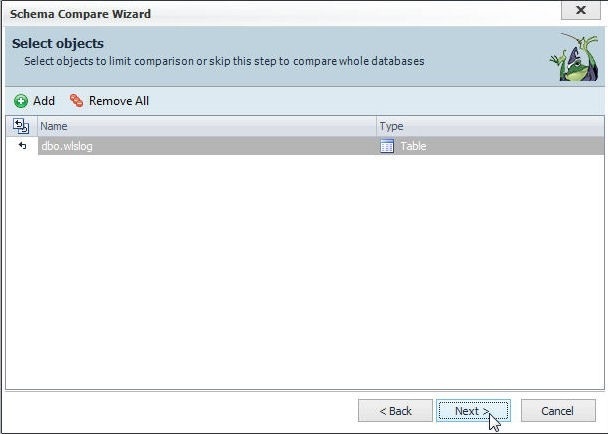 To compare the whole database skip selecting objects. We have selected the dbo.wlslog table for comparison, as shown in Figure 50. Click on Next. Next, select comparison options from those displayed in the Select Comparison Options wizard, as shown in Figure 51. Click on Next. The Schema Comparison gets started, as shown in Figure 52. First, the sources are loaded and data from source database started. After data from both the source and target databases has been loaded, the comparison starts, as shown in Figure 53. The comparison is performed by loading data to memory. After the comparison has been completed, as shown in Figure 54, click on Next. As shown in Figure 55, the Schema Compare Wizard gets completed. The results summary of the comparison gets displayed. The schema compare result includes Objects existing only on source, Objects existing only on target, Identical objects, Different objects existing in both, and Objects that couldn't be compared. Click on Finish. The Schema Compare detail gets displayed, including the objects compared and the differences in the objects' DDL scripts, as shown in Figure 56. The DDL script section/s that are in the target but not in the source are highlighted in a different color (red by default). The toolbar in the Schema Compare results window has options to Change current Comparison, Create new Comparison, Comparison properties, and Change comparison direction without reloading data from databases. The Script toolbar has options for Ignore case, Ignore whitespace, Next Difference, and Previous Difference. Right-click in a script to display some of the same options such as Next and Previous and some new options such as Go to Line… and Save As… as shown in Figure 57. 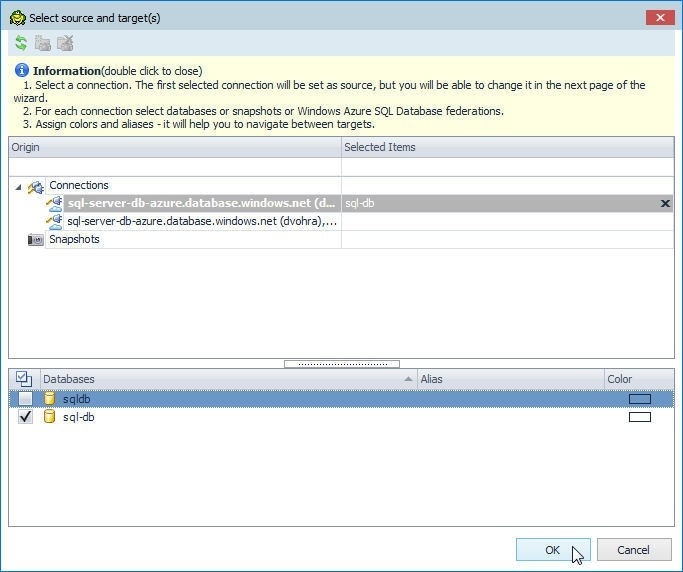 To make the source database as the target and the target the source click on Change comparison direction without reloading data from databases as shown in Figure 58. The comparison direction gets modified, as shown in Figure 59. The DDL Script sections that are in the source schema object but not in the target schema object are highlighted in green. 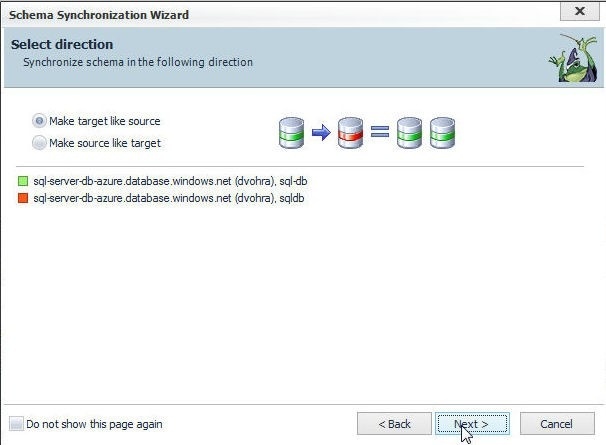 The Schema Synchronization wizard could be useful if schemas have differences and a synchronization has to be applied to make the target as the source or vice versa. The synchronization statuses may be displayed by selecting from the Synchronization statuses Sync and No sync in Filter as shown in Figure 60. 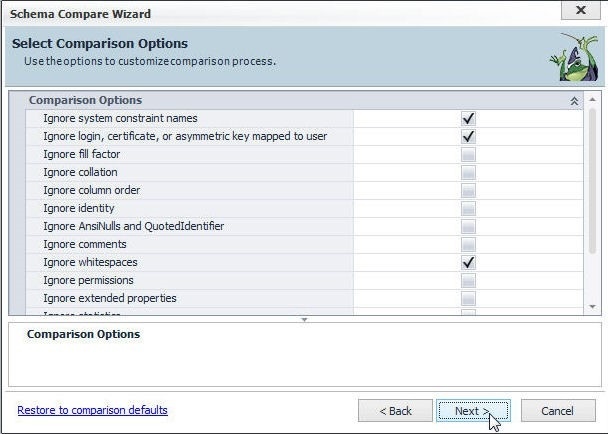 The sync options are set in Comparison properties wizard, which may be launched from toolbar as shown in Figure 61. 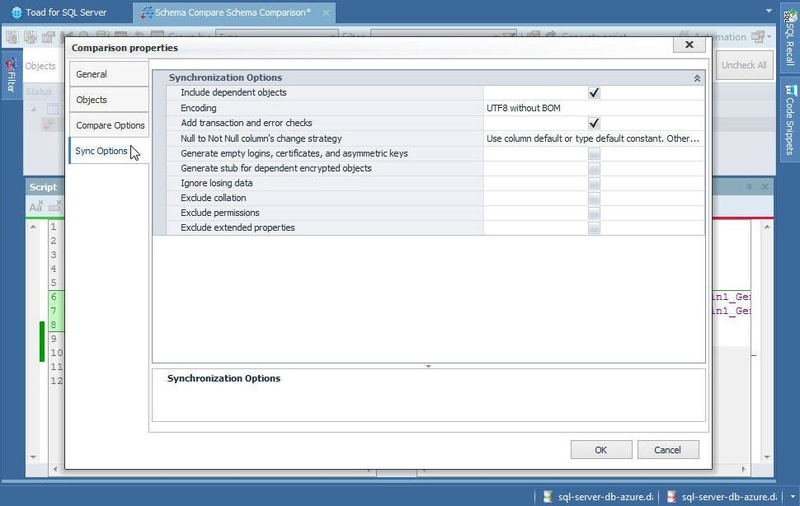 The sync options are set in Comparison properties>Sync Options, as shown in Figure 62. Select/deselect the objects to include/exclude in the sync. 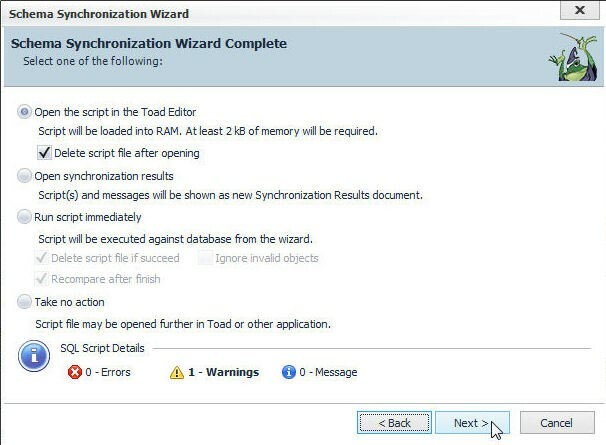 To launch the Schema Synchronization Wizard and generate the synchronization script click on Generate Script as shown in Figure 63. The Schema Synchronization Wizard gets launched, as shown in Figure 64. Click on Next. Select direction of synchronization; select Make target like source as shown in Figure 65. Click on Next. 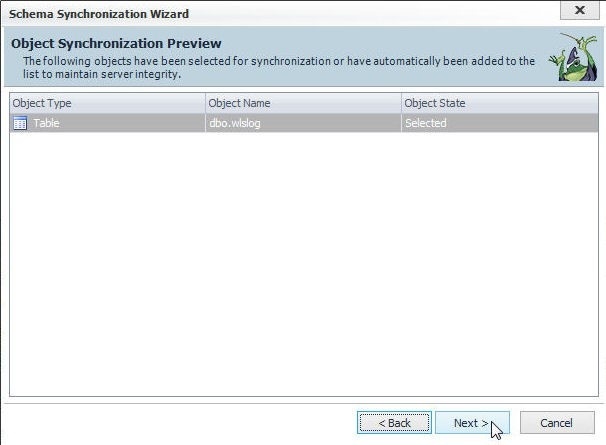 Select/modify Synchronization Options as shown in Figure 66. Click on Next. The Object Synchronization Preview displays the objects to be synchronized, as shown in Figure 67. Click on Next. Click on Next with the default option Open the script in the Toad Editor. The synchronization script generated gets opened in Toad for SQL Server Editor, as shown in Figure 69. 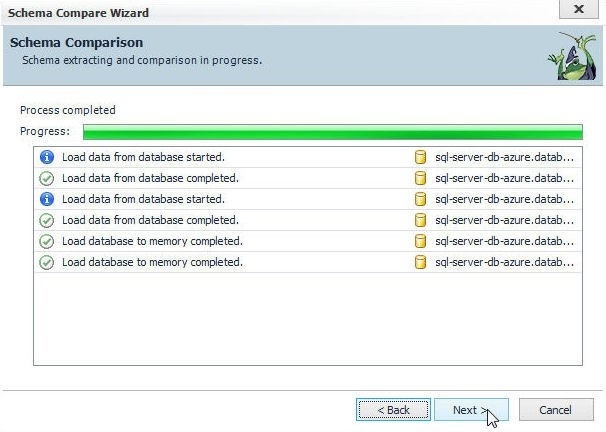 To delete one or more database instances in Azure SQL Database select the database instances and click on Delete as shown in Figure 70. In the Confirm delete dialog add “yes” and click on Delete as shown in Figure 71. 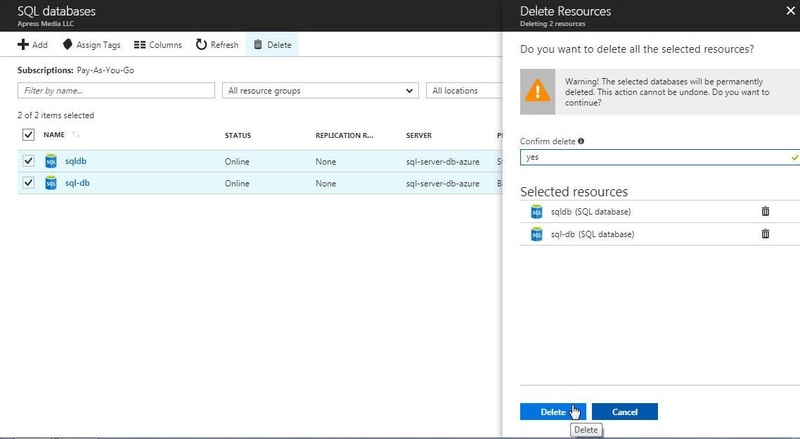 The selected databases get deleted from Azure SQL Database service, as shown in Figure 72. 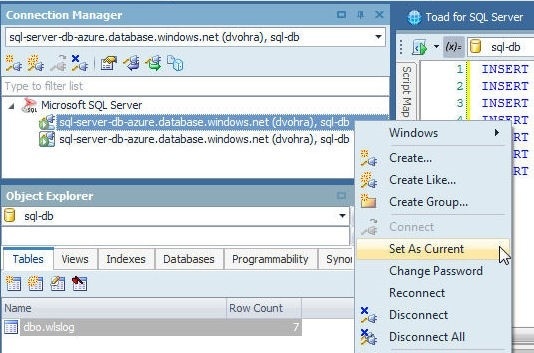 In two articles we discussed using Azure SQL Database Service with Toad for SQL Server. 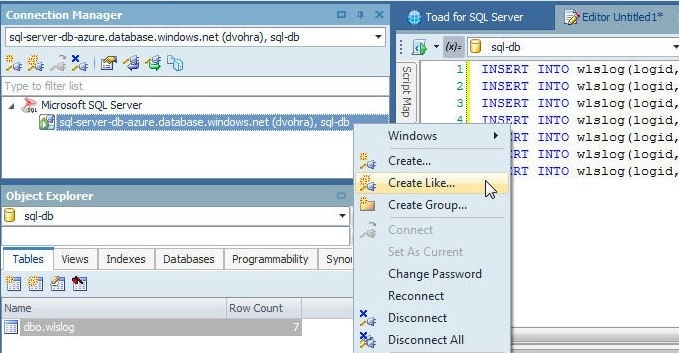 Toad for SQL Server provides several features and tools including the features to create a database, create a table, run SQL queries, explore database objects, and compare and sync schemas. 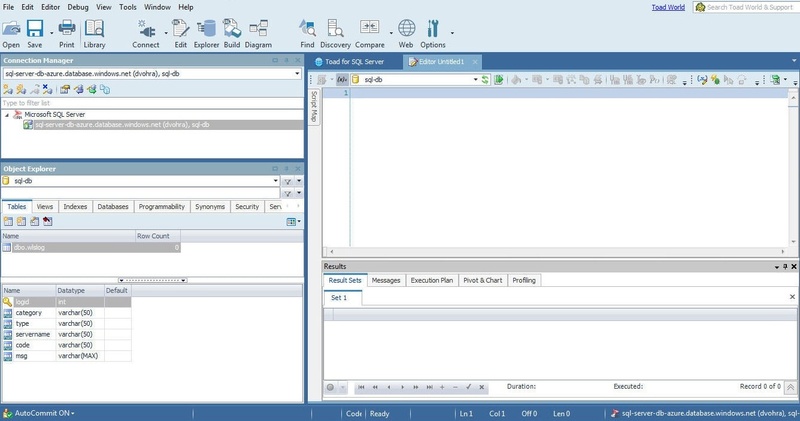 Editor's note: Try the full version of Toad for SQL Server free for 30 days.